When Studio Ghibli fans visit Japan, they typically make a beeline for the Ghibli Museum in Mitaka. But there's another spot that should be on any fan's list. Make that every fan's list. Back in 2005, a full-scale replica of Satsuki and Mei's house from My Neighbor Totoro was created for the World's Fair held near Nagoya, Japan. Goro Miyazaki designed and oversaw the house's construction. The house was created to look like after the movie takes place (thus, Satsuki and Mei's mother has returned home). Illustrator Martin Hsu visited the house earlier this year and said that while there are rules about photography, visitors are allowed to touch everything in the house during the 45-minute tour. Writes Hsu, "This includes opening up all drawers, boxes, lids, doors, windows, hidden doors, clothes, shoes...you get the idea." Hsu described the experience as entering a real house that is inhabited by a distant relative or an old friend. The house is filled with furniture and items of the era during which the movie takes place. This is Satsuki's desk with her books, pencils, and school bag. A hallway. Nearby, there is even the staircase the girls climbed early in the film. Next to the kitchen, you can see the bath. Their father's study is filled with books and papers. The calendar, it seems, even changes from month to month. In the above photo, it's February. The drawing shows an oni for Setsubun Festival. And there are all these lovely touches that evoke the film. Take the weathered wood, for example. This is the family's name plate for the house. There are other things to discover outside, including acorns under the house. It's all these little details that make this recreation so special and give this a strong sense of place. 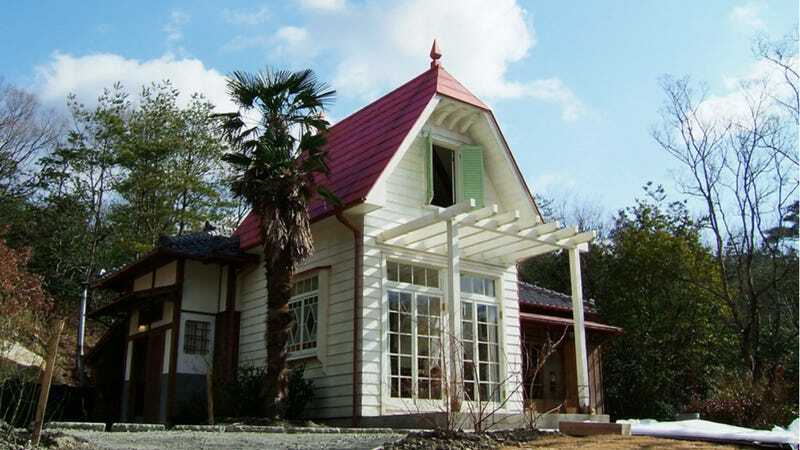 The Satsuki and Mei House is located at Expo 2005 Aichi Commemorative Park in Nagakute, Japan. It's necessary to purchase tickets before visiting, and there's more information on the house's official web site, which is unfortunately only in Japanese.